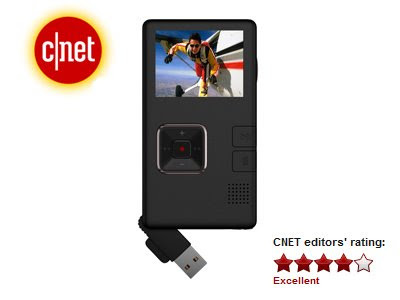 Solid 720p video; ultraslim design; removable, rechargeable battery; easy to use; one-touch video uploading to YouTube and Photobucket; includes mini HDMI connector and bundled cable for outputting 1080i video to an HDTV. No flash-memory slot; Mac users have to manually copy video files to their computers; white balance is slightly off and colors are a little amped. The Creative Vado HD may fall slightly short of the Flip Video Mino HD in terms of video quality, but it's stronger feature set may tempt you.